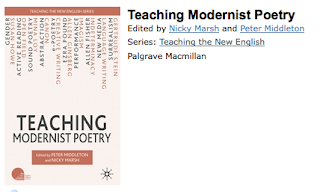 I have a long essay on modernist pedagogy coming out in a new book edited by Peter Middleton anI have a long essay on modernist pedagogy coming out in a new book edited by Peter Middleton and Nicky Marsh. The book is Teaching Modernist Poetry and is being published soon by Palgrave Macmillan. You can pre-order here. Other essays in the volume include Peter Nicholls' "The Elusive Allusion: Poetry as Exegesis," Carol Sweeney's "Race, Modernism and Institutions," and Charles Bernstein's "Wreading, Writing, Wresponding."